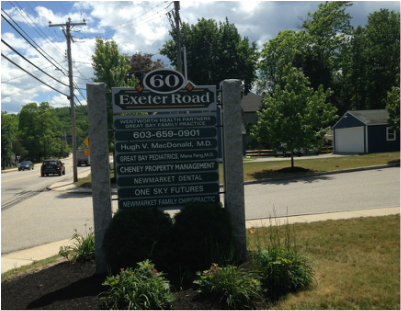 Located in the heart of NH's burgeoning Seacoast Region, this well proportioned business park is already home to the medical facility owned by Wentworth-Douglass Hospital, a Professional Group with a growing client base, and Cheney Property Management. This business park, on the widely traveled Route 108 [with 17,000+ vehicles per day], minutes from UNH (Durham), Portsmouth, Dover and Exeter is thus destined to be a prime business location in this area. Professionals looking to take advantage of this captured audience with little or no competition can build a client base quickly. Professional Group with growing client base, first class office space for rent with-in 7,200 sq. ft. building now available! Available with approval for 6,500 sq. ft. building. Priced at $350K the new building is approved and ready to be built to your specifications. Great opportunity to be a part of a Premier Business Park located within a growing market place! Lot 3 - Wentworth-Douglass Hospital operates Great Bay Family Practice at this location. Lot 4 - Currently under development - place your commercial business with us - best lot of them all. Directly located on Route 108. Home of Cheney Property Management.